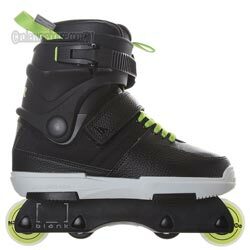 Now your kid can bust out his aggressive skating style with the NJR Rollerblade skate. The 58mm / 88a Rollerblade Street wheels, SG5 Bearings and 42mm anti rocker wheels allow this skate to move with a few strides and grind like a champ. The NJR Street Skate soul plate is built with UFS (Universal Frame System) and has four replaceable soul and negative inserts. The inserts stick up above the Soul Plate, this reduces friction when grinding. The thing that really sets this skate above other brands is the liner. The Liner works with the NJR Shell to complete the fit. The skate is shipped in the smaller size and if the child needs more room, simply remove the size extender in the liner's toe to create the extra room. Cuff buckle, 45 degree strap and laces pull the shell in to place. Cuffs are removable so you can switch out colors.